Cars built during the vintage years 1919 to 1930 are now very much in demand but that was not always the case. 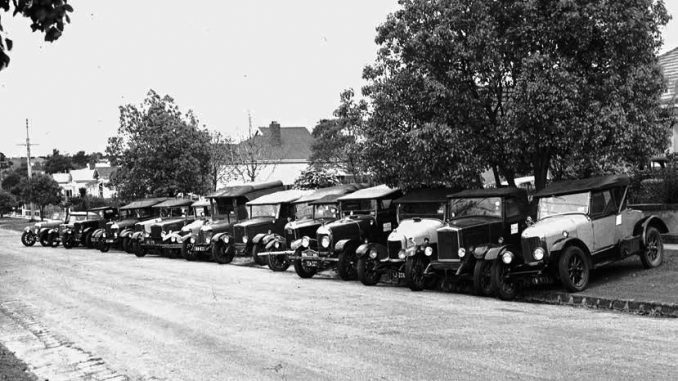 For five to six years after WWll the production of new cars barely caught up with demand, in fact it was commonplace for prospective buyers to be on lengthy waiting lists. This meant that many cars built in the vintage era were quite common in traffic until the 1950’s when production of new cars caught up – ideal for buyers but dealers were being swamped with old cars nobody wanted. Many went to overstocked wreckers, some supplied axles for home-built trailers and others were stripped of any ID and abandoned in quiet streets. But some were actually sold in decrepit state at very affordable prices or even given to young chaps seeking their first car. That was the wonderful era during which I got my driver’s licence, in 1954 to be precise, at the start of the great Rock‘n’Roll era. All the young men about town were getting A Model Fords, National Chevs, 4-cylinder Dodges, etc. ; all built in the late 1920s, all quite powerful, most of them unroadworthy to some extent or other but all very affordable. The fact of the matter was that these lads suffered under subliminal peer pressure to have powerful cars regardless of safety concerns so as not to be branded ‘square’. What a disgrace it was to be classed as such! There was one make of car that meant the owner was automatically classed as ‘square’ and that was the humble vintage Morris with its tiny 11.9 or 13.9 horsepower engine. To make matters worse a Morris from 1927 to 1930 was known as a Square Radiator model. Presumably out of fear for my safety my father insisted that a Morris be my first car, ‘ideal to learn on’ as he would say. He seemed to be oblivious to my pleadings as he looked through ‘Cars For Sale’ in The Age every Saturday. To my horror, one day he said we would go and look at a Morris advertised near home. We saw the car, it was a single-seater that had been used as a plumber’s packhorse, nuff said. In complete reversal of form my father told me to forget it but I wanted it come hell or high water. I could not explain my change of attitude at the time but now I’m sure it was Kismet twisting my arm. I drove the Morris to work every day, ignored the belittling calls of ‘square’, polished the polish-able bits, worked endlessly on the worn engine, transmission, you-name-it – until – one day the hood tore open in a storm. Disaster. Hoods were expensive and I was still an apprentice. With no cover the seat got drenched overnight and the dashboard instruments rendered useless; I had no choice but to take the train to work. However, the old Morris looked kind of sporty with no hood so over the next weekend I painted the car red, testosterone red. The finishing touch was a donation of two decals meant for Challenger Tractors. With these displayed along both sides of the bonnet the old Morris earned the name of ‘Challenger’ and set about challenging any car that looked as if it had the same or less power to a ‘burn’. This led to meeting other owners of other old Morris cars, not all of whom shared my enthusiasm. On one fateful day in March 1957 a gathering of six sympathetic enthusiasts at my home declared the formation of a club to try to save vintage Morrises from extinction. By August 1957 numbers had swelled to over 20, which meant a car trial was in order for the newly named Vintage Morris Club of Victoria. Some 16 vintage Morris cars plus a couple of other makes filled the street in front of my home and were lined up for the first of two photographs. The entries then took off for what became a drive into history. A second photograph was taken the next dozen or so years grew to be one of the largest, if not the largest of vintage car clubs in the world at the time. Today it runs regular events with a range of trophies and owns superb club rooms in Nunawading where it holds monthly meetings and social events throughout the year. Other car clubs rent their own rooms from the club and use the well-appointed auditorium for meetings. Full details can be found at: www.vintagedriversclub.com.au, or by email to secretary@vdc.org.au. If your club would like a talk on the joys and perils of driving old cars in the 1950’s email the writer at weefrogs@bigpond.net.au.